Tracey has coauthored a number of publications with her Yale colleague Dan Kahan, who spent a couple days here in the fall as our Boden Lecturer. In connection with Dan’s visit, I commented here on one of the seminal Meares-Kahan articles. I expect that Tracey’s talk on Thursday will touch on some of the same themes that were raised in Dan’s exchange with Mike Gousha and Milwaukee County District Attorney John Chisholm in October (webcast here). In addition to the short-term prospect of Tracey’s visit, I am also delighted to know that the Barrock Lecture will provide many future opportunities for us to bring other criminal law luminaries to Marquette. The lectureship was established through a generous gift from the estate of Mary Barrock Bonfield to honor her parents. Her father, George, was a Marquette lawyer, Class of 1931. More information about this public event is here. It is hard to think of any more important long-term challenge facing our community than improving the financial health and academic performance of MPS. Let’s hope that the emerging public conversation at Marquette and elsewhere will contribute to thoughtful, well-informed change. Community justice councils, or criminal justice coordinating councils, have been established in several communities across Wisconsin. These councils bring together key local decision-makers to address the coordination, cost, and effectiveness of the criminal justice system in their area. Milwaukee County, which has the State’s largest concentration of offenders and criminal justice resources, recently established its own Community Justice Council. Remarkably, this council has brought together leadership across the political spectrum to address crime and corrections in the Milwaukee area. The Marquette Law School Public Service conference is designed to support this collaboration and bring together criminal justice experts to lend their counsel to these efforts. For example, Jeremy Travis, the keynote speaker, is the President of the preeminent John Jay School of Criminal Justice at the City University of New York, the former director of the National Institute of Justice at the U.S. Justice Department, and the author of several books and studies on community corrections and reentry issues. This week’s faculty workshop presenter was our very own Professor Jessica Slavin, whose talk was entitled “Talking Back to IRAC: Legal Writing Beyond the Paradigm.” The project on which the talk was based has two components. First, Professor Slavin traced the history and questioned the utility of using IRAC and related formulas as vehicles for teaching legal writing. Second, she presented the results of her own empirical study of briefs submitted to the Wisconsin Supreme Court, which suggest that something other than strict adherence to IRAC characterizes the brief writing of at least one set of advocates. Yesterday, as part of our weekly faculty workshop series, we hosted Professor Julie Oseid of the University of St. Thomas. Her presentation was entitled “Show Me the Way: Mentoring Lawyers Through War Stories.” As the title suggests, her project is to consider, and to some extent justify, the use of war stories in legal education and more generally as a way to integrate new lawyers into the profession. Despite the fact that she was going head-to-head with Bud Selig, roughly twenty of our colleagues showed up to hear Julie’s thought-provoking talk. For me, the topic ties in with some of the other discussions taking place on this blog, and elsewhere, concerning just how it is that we should go about the business of creating lawyers. I’m with Dean Strang in believing that technical proficiency is a necessary but hardly sufficient condition to being a good lawyer. Reflectiveness, judgment, and (this one is vastly underrated, in my view) creativity all have a role to play, along with some number of less tangible qualities. Yesterday, our colleague Professor Olga Semukhina of the Marquette Department of Social and Cultural Sciences gave a presentation entitled Criminal Procedure in Modern Russia: The Path of Reforms as part of our faculty workshop series. She outlined the structure of the Russian Criminal Procedure Code (adopted in 2002), explained how the criminal process works, and offered her sense of the system’s shortcomings. Not surprisingly, the system looks very different from that in the United States. The Russian system has Continental roots, and consistent with that is considerably less adversarial than our own. Indeed, defense lawyers play an almost entirely reactive role. The defense has no ability to gather evidence, and until trial (which is the only adversarial component of the system) is limited to lodging objections to the work of the criminal investigator (a lawyer who is in theory an independent investigator, but whose physical location amongst the police and prosecutors tends to generate an affinity for the state). Plea bargaining is non-existent. Every case goes to trial, and 99 percent of those result in convictions. For me, the presentation underscored the value of the comparative perspective. It is easy to conflate familiarity with necessity, and exposure to the workings of another system has the tendency to dislodge some of our assumptions about the way the world works. 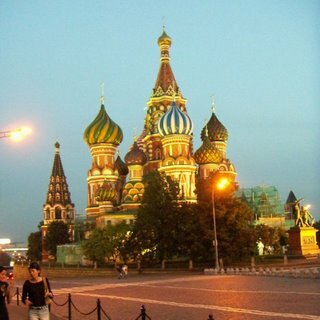 Another example: in Russia, a crime victim’s claim for restitution is part of the same case as the criminal prosecution, and the victim has a right to appeal the verdict in the criminal portion of the appeal. It’s an intriguing process to someone, like me, who is interested in the boundaries between the civil and criminal processes. 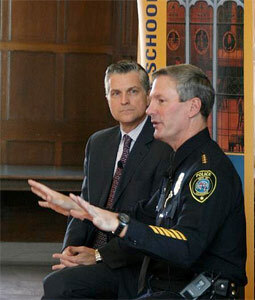 Mike Gousha began his spring-semester series of conversations “On the Issues” by hosting Milwaukee Police Chief Ed Flynn, who had come to the Law School last January within weeks of starting as chief and thus has a year under his belt (in addition to his substantial experience elsewhere). Anyone who has never heard Flynn speak is missing a treat: he is smart, extraordinarily well-spoken, and witty. A podcast of the interview, which includes as usual with Gousha questions from the audience, is available here and is well worth a listen. Because the devil’s bargain becomes this—and trust me, this is the truth—the overwhelming majority of your police officers come into the job with notions of moral clarity, and they want to protect the good guys from the bad guys. They function in a world that is far more ambiguous than they thought. And they have to make the kinds of decisions which the order book doesn’t cover and the general orders don’t cover, but they live in a rule-based environment. They know they’re expected to do something, and they do things—and most of the time they’re within a margin of error of right. Sometimes they’re wrong—their colleagues know it. Sadly, over the course of the years, if you’re not careful, if you don’t have adult discussions about it, the devil’s bargain is this: The good cop who screws up makes the devil’s bargain with the cop who’s a thief or a brute, where neither one of them says anything. And that’s where you don’t want to get. Flynn then proceeds to describe how in his estimation anyone who wishes to change this police subculture has to look upon the general police culture with a basic degree of empathy. Other aspects of the interview included Gousha’s asking Flynn to compare Milwaukee’s drop in violent crime over the past year with Chicago’s rise in the same. To the list of adjectives that I earlier used in describing Flynn, I should add another. He seems loyal as well: he never misses the opportunity, even while appearing at this Jesuit institution, to credit the Christian Brothers, whose institutions he attended for both high school and college. Dr. Shirin Ebadi, Nobel Peace Prize winner in 2003, is scheduled to be the keynote speaker for Mission Week here in February. The story of her life is an inspiring one. She was the first woman to serve as a judge in Iran, but was removed from her post after the Iranian revolution in 1979, because she is a woman and the revolutionaries thought women should not be judges. In 1992, she was able to obtain a license to practice law, and she has fought for freedom of expression, the rights of women and children, and other human rights. In a statement, the judiciary said it had ordered the closure of the Human Rights Defenders Centre in Tehran because it did not have the required legal permits, the Mehr news agency reported. It had also been “promoting illegal activities such as issuing statements on different occasions, sending letters to domestic and foreign organisations, holding press conferences, meetings and conferences” which created an atmosphere “of media publicity against the establishment in recent years”, the statement added. An AP article reports that the center was banned last year but had continued to operate. In that article, Ebadi states in that article that her group was planning on Sunday to honor Taqi Rahwani, who was imprisoned for 17 years after the Iranian revolution, and to celebrate the 60th anniversary of Human Rights Day (which passed on December 10th). By: Richard M. EsenbergPosted on December 1, 2008 Categories Legal Scholarship, Religion & Law, Speakers at MarquetteLeave a comment» on Do You Need CLE? Thanks to the Hon. Diane S. Sykes (Marquette University Law School, ’84) for speaking to my Wisconsin Supreme Court class this afternoon. Judge Sykes now serves on the Seventh Circuit Court of Appeals, but spent five terms on the Wisconsin Supreme Court and shared something of her experience on the court and about the nature of a collegial court with students. One of the things that I hoped was clear to the students is the notion that even these experienced and gifted lawyers on a court of last resort struggle with the law. Minds change and dissents become majority opinions. While differences in philosophy are real (Judge Sykes does not shy from referring to “conservative” and “liberal” jurists while warning that these labels are not comprehensive and their use is complicated), judges grapple with hard cases and their differences are not simply consequentialist. She talked briefly about a decision — which she knew we had discussed in class — about whether a condition of probation might be that the defendant (who had been convicted of wilful failure to support his nine children) refrain from having further children until he could support those he already had (a state of affairs that was extremely unlikely). While the potential consequences are unpalatable, then Justice Sykes (joined in dissent by two “liberal” justices, Chief Justice Shirley Abrahamson and Justice Ann Walsh Bradley) concluded that the law prohibited such a condition. Even if we disagree with that view, the recognition that hard cases can make bad law should be married to the idea that they should not. The Marquette University Law School came into being in 1908 when Marquette University acquired the propriety Milwaukee Law School and a recently established competitor known somewhat grandiosely as the Milwaukee University Law School. (Milwaukee University consisted only of its law school, and the school had only ten students.) These acquisitions were part of a larger project which converted Marquette from a tiny undergraduate college to a full-fledged university. To mark the 100th anniversary of these events, the Marquette University Law School has sponsored a series of symposia this fall focusing on various aspects of the history of the Law School. The first two sessions, focusing on the Milwaukee Law School and the first quarter century of the Marquette University Law School featured the research of historians Tom Jablonsky, Joseph Ranney, and Gordon Hylton. The third, fourth, and fifth sessions featured former students from different eras of the Law School who eventually entered law teaching as a career. (These included Jim Ghiardi ’42; Frank DeGuire ’60, Jack Kircher ’63, Michael Zimmer ’67, Chuck Clausen ’70, Christine Wiseman ’72, Janine Geske ’75, Tom Hammer ’75, and Phoebe Williams ’81.) The final session, scheduled for November 18, will feature the perspectives of three faculty members who did not attend the Law School but who have been members of the faculty since the 1980’s: Judi McMullen, Dan Blinka, and Peter Rofes. The symposium has revealed that the Marquette Law School has a rich, complicated history that is largely unknown to most of its current faculty and students. (In this regard, one suspects that Marquette is typical of most American law schools.) Moreover, the symposium has revealed that many of the frequently repeated statements about the history of the Law School — particularly in regard to its formative era — are not quite accurate. For example, the symposium has revealed that the most important figure in the history of the Law School is almost certainly former Dean Max Schoetz (pictured above), who was dean of the Law School from 1916 to 1927. Yesterday, Professor Anita Krishnakumar gave an intriguing presentation on her latest paper entitled “The Hidden Legacy of Holy Trinity Church: The National Narrative Canon.” A copy of her paper can be found here. In her paper, Professor Krishnakumar explores the controversial, but not often discussed, portion of the famous Holy Trinity Church decision. The well-known, and still somewhat controversial, portion of the decision finds the Court relying on the “spirit” of the statute instead of its plain language — with support from legislative history. The more controversial section of the opinion argues that even setting aside traditional methods of statutory interpretation, the statute — which was essentially an anti-immigrant labor statute — could not be enforced against the employer church because the United States of America “is a Christian nation.” Professor Krishnakumar argues that this methodology constitutes an interpretive canon for statutory interpretation: the national narrative canon. She also points to other Supreme Court opinions that use a similar methodology where the Court not only uses traditional interpretive canons, but also this national narrative canon — relying on history and public norms — in deciding the cases. Professor Krishnakumar warns that this newly-identified, but long extant, national narrative canon poses a threat to the perceived legitimacy of courts’ statutory interpretation because it often runs contrary to the text of the statute, produces bad policy, and can create an unfair exception for a particular entity. While the national narrative canon has been used selectively, it will be interesting to see if the Supreme Court — and indeed other courts — moves more towards this public norms approach to statutory interpretation. In this age of New Textualism, it strikes me as likely that — as seen with the cases Professor Krishnakumar analyzes — to the degree its used, the Court will couple the national narrative canon with another more traditional approach to statutory interpretation in reaching its decision. In this regard, the Court will continue to make the national narrative canon less effective in terms of precedential value, seemingly serving more as dicta. However, its potential effect should not be understated, as these portions of the Court’s opinion can still have powerful effects in the political realm in ways which may run contrary to our society’s commitment to pluralism and diversity.